11 Transfer an existing site into Joomla! It is one of a series of documents introducing Joomla! 2.5 and is the last of five documents about designing and creating a new web site. Everyone - who is going to set up a Joomla! site. It is written on the assumption that you do not have much web experience. There are five 'background' pages with essential information about different aspects of designing a site. The background is separated so that the flow of creating the site is not interrupted by asides. The documents are all aimed at helping you to understand what is going on, whether you have a large or a small site. If you have little experience with web sites, you will need to make more use of the background material than if you are an experienced developer. They are there to be used according to your needs. Give thought to content and design, as recommended in the background documents. Best practice is to have thought about the site and to have a plan of the content and design features before you create the site. This can be done on any instance of Joomla! running Joomla! 1.5 but the detail will depend on the facilities you have available. It is useful to use 'localhost' to get familiar with the processes involved. This is a very good way to explore how to create new content because you can try things without doing any harm to an established site. An instance of Joomla! with no data is particularly valuable here. Cross Reference: Another document in this series tells you how to download an instance of Joomla! on your own computer and install it both with and without sample data. Localhost installation of Joomla! on your own computer. You will need Super Administrator permissions. Decide which of the Templates to use. 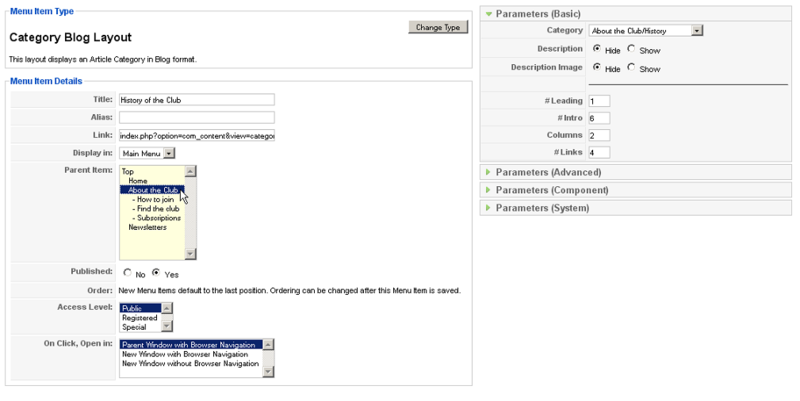 Using Template Manager you can alter the Default. It is useful to add these before adding the content hierachy. The login module is essential to allow you (and anyone else) to login to the site to view any content with more than public permissions. This is needed before articles and menus can be restricted to Registered users. 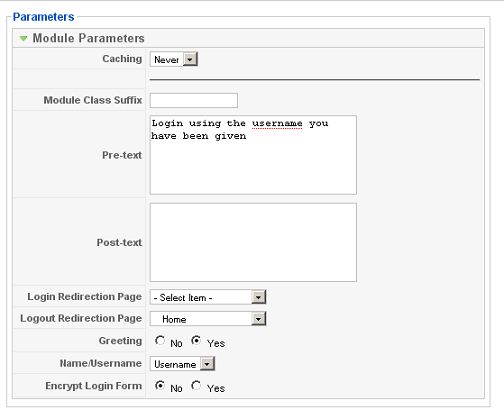 This Module displays a username and password Login form. It also displays a link to retrieve a forgotten password. Menu Selection - leave this as All unless you want to have the login on selected pages. When the person logs out, they are re-directed to the Home page. Remember these can be altered later. You can alter a few display options - here there is some text above the login boxes. 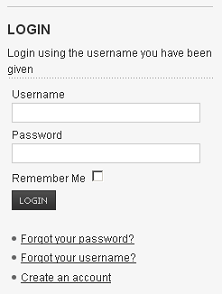 If User registration is enabled then the link "Create an Account" will be shown to invite Users to self-register. This module displays a 'breadcrumb' trail of where you are in the menu. You should have an inital idea of the Categories you are going to use. If not - then re-visit the background on this which is Linked here. The rest of this part is about the mechanics of creating Sections and Categories, followed by Menus and Articles. Here you need also to enter the Section. There is only one but as more are created they are available in a pull-down list. Creating Categories. Note that there are brief instructions about the use of the page, planned to have a list of Newsletters. Other options are covered in Help. Here the Description allows a brief instruction about the use of the page, planned here to have a list of Newsletters. Joomla! adds the Main menu to your site automatically to display the Home page. You should already have thought about the Menu and Menu Items you are going to need. Make sure that you use names that makes sense to anyone visiting the site. If not - look again at the Background information. In the example the Menu Items are closely related to the Categories, although not necessariily displayed in the same order or with the same names. 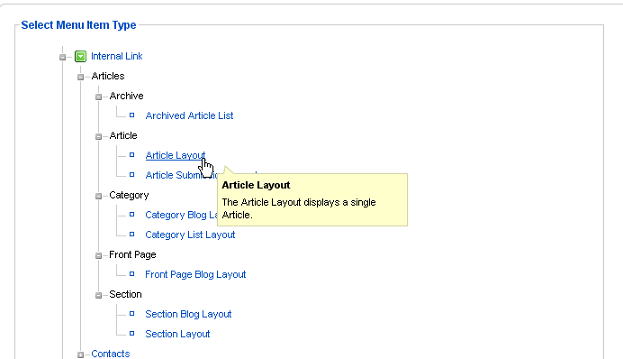 For the blog and list layouts you do not need any articles available before you create the menu. To create a Menu Item for an Article layout, you do need to have an Article to use in the Menu definition, even if it is not complete. To create a menu for an Article layout, you need to have an Article to use for the Menu definition, even if it is not complete. Create Articles for any that you are going to define as having Article Layout. You can leave them as Uncategorised as they are positioned in the right place by the menu definition. But if they really belong to a Category, then select the right one. Cross Reference: For creating new Articles see, Hands-on how to create a new Article and Manipulating articles using the Front-end. 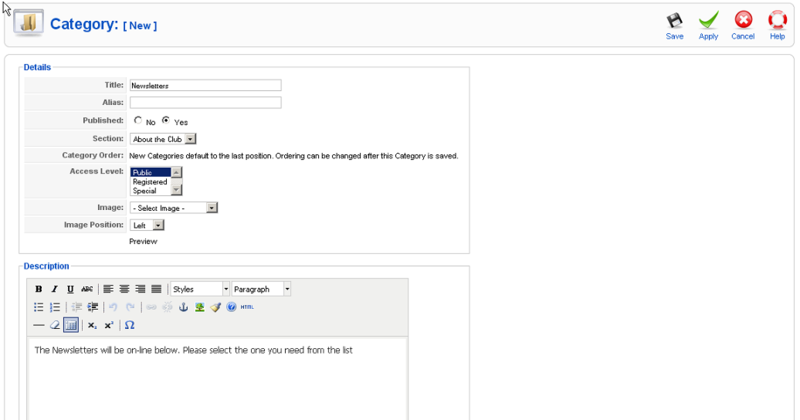 You can also use the Article Manager in the Back-end. The Menu Item Type controls how articles are displayed. This shows the one for Article Layout. Preview or go to the Site to see the result. The other Parameters can be altered to show fewer things in the Table Headings. Most content is added after suitable Menu Items have been created. Each site has its own policies about who creates Articles and maintains the content. One advantage of a system such as Joomla! is that Articles can be created by numerous people if they have the right permissions. Cross Reference: For creating Articles see, Hands-on how to create a new Article and Manipulating articles using the Front-end. You can also use the Article Manager in the Back-end. Part of thinking about a site is to decide what kinds of users you will need to give specific permissions to. This also influences the levels of access you allowed on Sections, Catagories and Articles. The User:[new] management page allows you to enter the details. To the left you enter the name and user name, as well as selecting the Group for the user. To the right there are options for other choices, including different editors. So you can make different choices for different users. If nothing is chosen under Parameters, then the Global choices will be used. Self-registration: Some sites allow self-registration. In other words, new users register themselves. Make sure that the default Group is Registered so that no edit permissions are given! Contact management: This is beyond the scope of this document. Transfer an existing site into Joomla! Sometimes there is already some material on an existing site and it seems a good idea to use this as a basis for a Joomla! site so that the content can be managed more flexibly. There is no automated way to press a button and transfer a static site into Joomla! There are various strategies for doing this. A simple conversion is useful if you have very little content or the site has a simple structure. For the best result, it is better to re-think the design of the site and then transfer the content. Here you do not re-think the structure of the site. A method for doing this is covered here. It steps through a possible method, starting with creating new articles and copying the text from existing pages into them. It does not design a content hierachy to start with. Decide on the Menus. You do not have to stick to simple article menus - you could have blog or list layouts for example. Copy and Paste the content from the existing pages into the editor. You may need to alter layouts and do some editing. This would give a site with the functionality appropriate to Joomla! from the beginning for very little extra thought and a lot less muddle and chaos. Most of the initial work would be in transferring the content should it need a lot of extra editing. There is a lot more to Joomla! than the basics - this will link to further information and concepts. http://docs.joomla.org/How_to_Convert_an_existing_Web_site_to_a_Joomla!_Web_site Written for Koomla! 1.5 but the general principles apply. You need some computing background to understand this, especially file management and using FTP. You also need to be able to login to your hosting service management site. This page was last modified on 29 April 2013, at 12:50.